I was up on the AT in Georgia on Wednesday to do some trail magic and a gear shakedown hike for my upcoming CDT thru-hike. 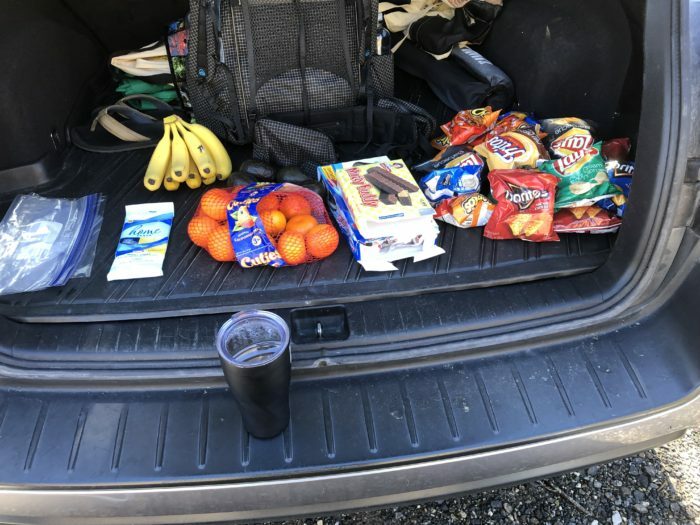 The plan was to get to Unicoi Gap in the morning with my cooler full of food and drinks and disburse them until midafternoon, after which I would hike up to Tray Mountain and camp for the evening, then return the next day. I was really excited to see all of the aspiring thru-hikers and to have the chance to provide trail magic. I had fresh fruit and avocados, and even some Greek yogurt for the breakfast crowd, as well as the usual chips, Little Debbie cakes, Gatorade, and sodas. I always like getting fruit when I’m hiking because it is something I seldom have on trail, and often skip over in town on the race to eat the largest pizza and ice cream cone I can find. Who’s ready for some snacks? It was all really fun and I loved meeting some of this year’s crop of aspiring thru-hikers. Their energy really pumped me up, and I found myself reliving my own AT thru-hike through what they shared. I also found myself really wanting to give advice, or talk about cool parts of the trail or places to stay, and I had a strong desire to “overshare” about the trail. I had to put on the brakes. It’s a pretty natural tendency for those of us who have thru-hiked before to want to share that experience with others. After all, most hikers would agree that it is a special, common bond that we all share. I had to remind myself though that sharing isn’t always caring. I was usually grateful for advice on the trail from other thru-hikers, but occasionally I found myself wishing people would let me discover things on my own, or feeling annoyed when people commented on the efficacy or weight of my gear when it didn’t seem to come from a place of positivity. I started thinking about this in the parking lot at Unicoi Gap and decided that I would write about it before I get too heavily into the details of my CDT gear and logistics planning. I’m not telling others what to do; this is just the way I personally feel, and more or less a reminder I compiled for myself for those times when I get a little too excited with the trail talk. You may have your own thoughts or guidelines, and that’s OK. I am only responsible for myself, and therefore I would only ever hold myself accountable for this kind of thing. My business ends on my side of the street. I don’t need to worry about other people. I’ve definitely broken some of these before (for starters, number one. Sorry whomever that was.). It’s hard not to get excited and relive the adventure of thru-hiking in front of newbies. I’ve largely had positive experiences with past thru-hikers talking to me when I was first trying to complete a thru-hike. I think the trail tends to breed good people. There have only been a few exceptions to this. Let ‘em hike. It’s cool to be friendly and say hello and strike up a conversation, but if someone looks like they just want to hike on, then maybe I shouldn’t launch into describing that time at Pine Grove Furnace when I ate a bucketful of ice cream and threw up in the lake while swimming. I once had miles to make too. They have a map (or they should). When I was attempting my thru-hike, sometimes people I would run into on the trail would randomly start to tell me what to expect coming up in front of me. “OK, you’re going to have a big climb, and then a few mud puddles, and then a big rock, and then some trees.” The intention is all well and good, but aspiring thru-hikers have maps and trail data, so unless there is an immediate danger like an unreported raging fire or a super dangerous stream crossing, I should let them discover the trail for themselves if they haven’t asked me about the upcoming terrain. No fearmongering. Thru-hikers don’t need general warnings about bears, the horrible weather in the Smokies, or how they shouldn’t be hiking without pepper spray. Unless there is a bear on the trail that I just passed or a specific imminent danger like a flashing creek just up ahead, fearmongering doesn’t help anyone. Instead, I should try to get them pumped up about their experience. The mental game on the trail is more than half the battle for most. New thru-hikers need positivity—they are doing something pretty awesome, after all. They can and will make their own decisions about bears, the Smokies, the weather, and everything else. No gear judgment commentary. If someone doesn’t ask for my opinion on their gear, I shouldn’t give one. Maybe I think their gear is insufficient or will fall apart, but it might work just fine for that person. Also, people have different budgets and gear philosophies. They may not be able to afford the lightest tent known to man (or want to pay that much if they can afford it), but how cool is it that they are living their dreams on a budget they have instead of waiting? Pretty darn cool. If I see a piece of gear they are using and are genuinely interested in whether they like it (because I might want to purchase or make it), then that’s fair game for discussion. Positivity is the key litmus test. Set a good example. This should go without saying, but I’m listing it here because, as people, it’s in our nature to look to other people when doing things we haven’t done before. Even if that too-cool-for-school newbie thru-hiker seems to be ignoring me, my next move could be the one thing he or she picks up. Picking up trash on the trail is a good example. I try to do this every time I hike. At the end of the day, the trail is what I make it, and even if I only pick up two to three pieces of trash, it helps. Practicing good trail stewardship and Leave No Trace principles sets the right example for the next class of thru-hikers. This can also be as simple as me being courteous and respectful while on trail. These are the five principles I thought of while at Unicoi Gap. I do try to hold myself to these when I meet aspiring thru-hikers on the trail, and now that I’ve taken the time to think through the topic, I will try to do a better job of adhering to them. If you find them useful or can relate to them, great! If not, that’s OK too—differences are why the world is not boring. Thuganomalicious (or something similar. I’m sure I’m getting that wrong), left, does the hiker handshake with Hungry Cat. I was super excited to meet the hikers at Unicoi Gap and Tray Mountain yesterday. Hopefully I stayed mostly within my own guidelines and they had a positive experience getting trail magic. 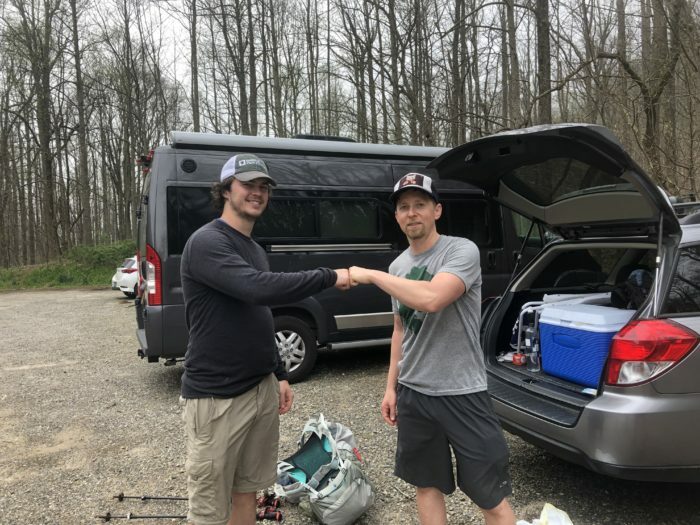 I want to give a special shout-out to a few of the AT thru-hikers I met (at least the names I remember, or hopefully remember): Bonecrusher, Lady Who Waits, Bear, Lambo, Ruckus, Bruno, Honeybun, Tinkerbell (and dog Peter Pan), the trio I dropped into Helen, the dude featured in the above picture with me who had a funny name like Thuganomalicious Pants (I’m sure I got that wrong, but his name was because he wore extra large Frog Toggs that looked like MC hammer pants), and many others without trail names yet. You guys rock and I hope you enjoy the rest of Georgia on your way north. I know this piece was topical in nature and I promise to get to my CDT stuff in more detail. My next post will talk about logistics and gear. In a few weeks I’ll be in New Mexico. That is just a great reminder for everyday life. Superb points you make. I will definitely keep your suggestions in mind when I head back on the trail next month. I realize now that sometimes my desire to help people isn’t really helping them. Judgemental gearheads are why I generally avoid most online hiker communities, so I’m really glad to see it included on your list. Be “Fresh Grind”, from Leapfrog Cafe. As fine a human being as you’ll come across .